I can clearly remember the time when Fast & Furious 3 was released and how hyped up my friends and I were about drifting and stuff. And now Dmitry Verbilov brings back that thrill with literally just one picture of his newest Mitsubishi Lancer EVO IX. The car itself is a neat model and looks great with the windscreen piece and mudguard parts from Speed Champions sets. Dmitry also managed to shape a nice-looking front part, not to mention some complicated patterns on the front doors. 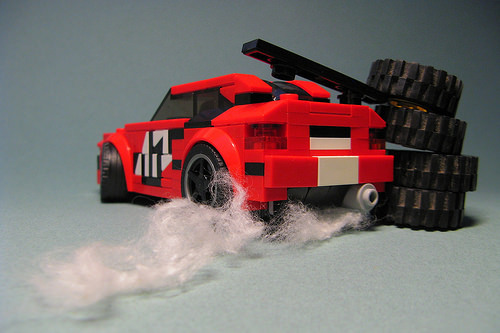 However, I’m mostly impressed by the usage of cotton wool pieces to imitate white smoke coming from burning rear tires. Even though it’s not a regular LEGO piece, it’s a brilliant trick to make a picture look dynamic and impressive.